What a n00b! (old posts, page 2) | What a n00b! While playing with WordPress on nginx for my last post, I discovered that a majority of the how-tos out there on running PHP/MySQL applications using nginx left a bit to desired. Here's the steps that I took to get my application (WordPress, specifically) working. The installer will prompt you to enter a root password. Make sure it's a fairly good password, but also be sure to record it as you'll need it later. I used the following as my site file. A majority of it was taken from the default site and parts from other how-tos. You can rewrite the /etc/nginx/sites-available/default with this templated page (in my example, I assumed that the site is called site.com and that you are using WordPress at /var/www/wordpress). Be sure to change the "root" and "SCRIPT_FILENAME" lines. You can now install your application as you normally would using Apache. In this example, you can download the WordPress packages to /var/www/wordpress and install from there, making sure that the files are owned by the www-data user. It's a slightly older post, but after I read Workswithu's report on the four features that they believed set Ubuntu apart, I had to agree whole-heartedly with the fourth one regarding implementation of auto-complete on the shell. As I was reading, I constantly dropped to the shell to discover new tab-complete features that I didn't know about, including apt-get that I really didn't notice but used every day. Anyway, today I discovered yet another. This kind of defeats the purpose of DNS, but I discovered that if you put a host into the /etc/hosts file on a Ubuntu 9.04, then both SSH and rsync tab-complete for you when you start typing the hostname. I'm not sure about scp, but I'm sure it works the same way. Extending this functionality further, it would be awesome if I could tab-complete from my known_hosts file, but that doesn't seem to work. Anyway, if you find yourself SSHing or rsyncing files to a host or set of hosts all the time, this trick can be very time-saving. Perhaps not quite as time-saving as being able to SSH with the click of a mouse, but often its not very convenient to leave the keyboard just to save a few keystrokes at the shell. I just got my Google Voice invitation today. It's pretty sweet. It allows you to give out one phone number and configure it to ring multiple phones depending upon who is calling and when they are calling. It also packs voicemail and SMS into a convenient place along with a host of other features. The other thing that it does is it completes the communications circle of products that I use from Google. After thinking about it for a few minutes, I use Google for everything. It knows my web searches, my web site's stats, and manages my ads. I also use Gmail, Google Talk, Google Calendar, Google Reader, now Google Voice, and occasionally Google Docs. When I get lost I pull out the Google Maps app on my phone. I'm even playing around with their Android operating system and am considering buying a phone based upon it when Verizon gets a model. Wow. That's one heck of a list when I fire them off one at a time. I'm not even using all the services available to me. It's no wonder Microsoft wants some of Google's search market share. Whenever I search I come up with new Google services to sign up for. One of the biggest advantages for Google up to this point (at least for me) as been the fact that Google didn't have an operating system. This caused them to have to integrate and build tools for other operating systems. Microsoft has the luxury of building its own OS plus its online offerings so it can integrate easily into its own products. We'll see what happens when Chrome OS comes out, but that's a long way out. For now I guess Google's got all my data.. Turns out, I had been messing with the MySQL permissions to get my MythTV frontend machine to work and hadn't noticed that I broke the backend. If you install MythTV and notice that you get constant disk access after it starts, this is likely the culprit. Since I like to be an example to others of what not to do, I thought I'd share my fun today. Today I was doing a little cleanup on our systems and removed an empty directory that had been mounted by another system via NFS. (HINT: if you're stuck in this position and need help fast, scroll to the end, otherwise I'm going to tell you the story) Not really realizing that I had done this, I went on with my day as normal. Later in the day, I was asked why all of a sudden certain operations were timing out on that system. The first thing I checked was disk space on the device which returned some mount points, but not all and "sat there doing nothing". After a little while I closed the session and opened up a new one. Running a mount returned all the mount points that allegedly existed, but the list from my 'df -h' stopped at the mount right before the NFS mount point in question. Doing a 'umount -f /mnt/point' simply returned a "device is busy" error. The particular directory that I had deleted was an old directory that we were using for Virtualmin to do its backups to and had moved. Since it was complaining I thought I'd just try doing a bounce of the Webmin/Virtualmin services quick to see if that helped since Virtualmin should've been the only application that needed to have files open in that directory. But, alas, didn't make a difference. Then I had the bright idea of trying to find out what processes might've tried to have files open in that directory. I ran a 'lsof | grep /mnt/point' and it "sat there doing nothing" again..
After my failed attempts, I decided to try to recreate the directory on the other end, re-export the share and hopefully my system would pick back up where it left off. Unfortunately, I didn't realize this, but my export had already been deleted from the /etc/exports file as well so recreating the directory and re-exporting the NFS shares did me no good. Voila! No more timeouts checking disk space, lsof's, and the mount point is no longer mounted. Quite often we read about how small things are so much more complicated on Linux than on Windows. I set out on a journey today to add a printer via USB to my Ubuntu desktop and share it out to my MacBook at my new apartment. If there's one thing in this sick, twisted world that I hate, it's printers. Given that background, I was shocked at just how easy it was to setup the printer, share it out, and connect to the shared printer using my Macs and other Linux machines on my home network. 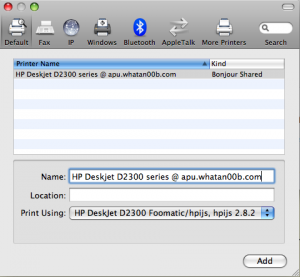 The printer that I worked with was just a cheap inkjet - an HP Deskjet D2330. I had a heck of a time with the driver for OS X directly connected, so I wasn't expecting much. I plugged in the USB cable and voila, my Ubuntu desktop popped up a message that the printer was ready to rock. I opened up OpenOffice.org and printed out a doc just to make sure my desktop wasn't just playing with my heartstrings. Sure enough, it printed my doc just fine. Now, on to sharing. Doing a little poking around in the GUI, I found the printer configuration at System -> Administration -> Printing. Under the policies, the "Shared" check box was checked, so I popped open the System Preferences on my MacBook and tried to add a printer. I couldn't find the printer in any of the discovered list. A quick Google search reminded me that the CUPS configuration web GUI could be found at: http://localhost:631 when CUPS was installed and running. I navigated to the page and found the check box called "Share published printers connected to this system". I checked it and clicked "Change Settings". When prompted to authenticate, I used my desktop login username and password. When I flipped over to my MacBook, I opened up System Preferences again, added a printer and there my printer was. I clicked add and it was ready to go within moments. After my successes on my MacBook, I decided to press my luck just a bit more by adding my Linux laptop as well. On my laptop, I run Xubuntu 9.04 and it was almost as easy to setup. I just opened the printer configuration window via Applications -> System -> Printing and clicked on the new printer button. The Xubuntu machine scanned for printers on the network, discovered my printer and added it. I can't say I've had nearly that smooth of an experience adding any sort of printer to Windows. Eventually, the digest generation would finish and my websites would come back. Sometimes it would take just a few seconds and other times it would take about 30 seconds. After doing a little digging, I found that a number of people were having this issue, with very few answers. My system was returning a value somewhere around 150-200 and went down to nothing while Apache was generating its digtest. When I looked at the same file on other systems, they were all 2000+, an obvious problem. According to a couple of blog posts, installing rng-tools and running the rngd daemon seemed to be the answer. /etc/init.d/rng-tools: Cannot find a hardware RNG device to use. invoke-rc.d: initscript rng-tools, action "start" failed. Now, 'catting' my entropy_avail file displayed over 2000 like my other systems and Apache starts right up on a restart. Yahoo! Zimbra Desktop is almost reaching full release status, but it still has one limitation: only one installation on a machine is supported. The problem lies in the fact that Zimbra Desktop uses a Jetty server for the backend application and each instance is configured to use the same port. We can hack Zimbra Desktop by changing the port from the default to another port on the system and then add another installation. This hack worked on Ubuntu 8.10 and should work on any Linux distro. I tried it on my MacBook, but Zimbra Desktop put a directory in the /Applications folder that contained prism and the installer didn't allow me to continue. I haven't tried this on Windows, but I imagine it should work in a similar way. Disclaimer: This hack is not in any way supported by Zimbra or by the author. I am not responsible if your Zimbra Desktop data becomes unusable. Please backup your Zimbra Desktop installation before beginning if you already have data in Zimbra Desktop. Also, this hack will most likely break upgrades and have to be re-applied. A working knowledge of some Linux shell is recommended. Now that that's out of the way, let's begin. 1. Install Zimbra Desktop as normal. 2. Edit Jetty and Prism config files. Open up each file with the editor of your choice and change the text "7633" with "7634" or some other port of your choosing. Just make sure they are all the same. 3. Start Zimbra Desktop again. If all config files have been changed, the Zimbra Desktop sync engine will start as normal. You can launch the client from the desktop shortcut, or you can connect using another browser. To get the URL to connect to, consult the file: ~/zimbra/Zimbra Desktop/Zimbra Desktop.webapp/webapp.ini and look for the line "uri=". Otherwise, you will receive an error from Jetty saying that you are unauthorized. If you receive an error, be sure to check that all files have been changed by running the grep comand at the beginning of step 2. 4. Login as second user and install. Login as the second user that you want to install Zimbra Desktop as. You will then be able to install Zimbra Desktop as normal. You can stop at this point if you don't have any other users or if you don't plan on doing upgrades. I haven't tested this with upgrades, but I imagine that an upgrade will return it to the normal ports. In which case the upgrade will fail and data loss could result. I would recommend repeating steps 1-3 and changing the port in step 3 to 7635 (or whatever port you should choose). That's it! You can now have multiple users with their own Zimbra Desktop instance on your computer. Again.. this how-to is a total hack and not supported by anyone, but it worked for me. Upgrades to the software will most likely break the setup and could result in data loss. Of course you're already doing this, but be sure to run a backup before trying any upgrades to the software.